Despite the extra junk in our trunk, Your Mama and the Dr. Cooter are both avid tennis players and fans. Wimbledon winner and Olympic champion Lindsay Davenport happens to be one of our favorites ladees on the circuit. Not only does she have some of the cleanest strokes on the court and a punishing forehand that makes us weep with envy, like Your Mama, shes a moody player with a two handed back hand. The other day we received a covert communique from Vlad the Revealer and shortly thereafter a second one from Mister Dave at Celebrity Address Aerials who both whispered in Your Mama's big ear that Lindsay Davenport and her investment banker huzband Jon Leach listed their ocean front hideaway in Ventura, CA for sale with an asking price of $5,500,000. 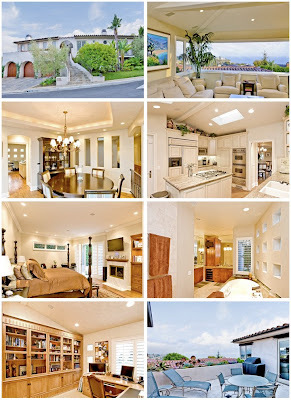 After a quick poke around the internets, we discovered that the California couple have also put one of the two homes property records show they own in Laguna Beach, CA on the market with an asking price of $6,395,000. We call that a celebrity real estate double whammy! DESCRIPTION: Revel in chic California Riviera style and impressive ocean views from this very private Emerald Bay residence. An abundance of space - a luxury within Emerald Bay - is found here, amid 5 bedrooms, 5.5 baths and an open, flowing floor plan...Each room in this tastefully appointed home is finished with luxe materials, including artisan stone and tile, custom paint finishes, plank hardwood flooring, plantation shutters. Finished garaging for 3 cars plus golf cart and world-class Emerald Bay amenities. YOUR MAMAS NOTES: Laguna Beach, once the sort of laid back coastal California town the Beach Boys crooned about, is now a place where old school hippie artists and surfers share the streets with rich white men and their over-injected and prodigiously implanted ladee-friends who look not so different from the too bejeweled and upsetting cat fighters on The Real Housewives of Orange County. Listen kids, we know we're making a broad generalization and not every woman in Laguna Beach has 6 pounds of silicone or saline shoved up in her boobies. But still, a lot of them do. If any of the children have been to Laguna Beach recently, as we have, y'all would know we are speaking the truth. Anyhoo, property records reveal that Ms.Davenport picked up her house in the guard gated Emerald Bay community in May of 1997 for $2,040,000. According to listing information, the two story house measures a good sized 4,999 square feet with 5 bedrooms and 5.5 bathrooms, all of which is sqeezed on to a tight .14 acre lot. The fancy-pants Emerald Bay community straddles scenic Pacific Coast Highway just north downtown Laguna Beach. Some of the more impressive properties in Emerald Bay perch precariously on and cantilever well beyond the edge of sheer cliffs that drop down to the Pacific Ocean. Other more modest but still atrociously expensive Emerald Bay properties climb the hillside on the east side of the highway. At the northern end of the community is a spectacular private beach accessible only to people rich enough to live in Emerald Bay. Residents of the approximately 550 homes also have access to a community center, six tennis courts, swimming facilities, an outdoor basketball court, three beach volleyball courts and three parks two of which have children's play grounds. In order to take advantage of the over the roof top ocean views, Miss Davenport's digs were designed as an "upside-down" house which means the main living spaces occupy the top floor. The front door sits at the top of a gently curving and slate tiled stair case and opens a proper entrance hall on the upper floor which includes a large formal living room with fireplace, a formal dining room, and a family room, all of which have ocean views and all of which surround an ocean view terrace. While well stocked with a full complement of expensive appliances, the island kitchen looks exactly like a million other kitchens in Orange County. We are deeply disappointed to see that someone has placed (probably fake) greenery and a bunch of ceramic doo-dads atop the kitchen cabinets. If there's anything Your Mama loathes more than a damn pot rack, it's fake plants and knick-knacks tucked up between the cabinets and the ceiling. Not only do we think it looks ridiculous, these mistakenly placed items collect dust and cooking residue at an alarming rate. One excellent feature the kitchen does offer, according to listing information, is a handy-dandy dumbwaiter for hauling groceries up from the lower floor, a convenience our sassy and scrupulously stair avoiding house gurl Sventlana would surely swoon over. To the right of the front door and tucked away beyond the small office and powder pooper is a generously sized and well located guest room with a sweet en-suite, fireplace and balcony. While we love that the architect has been kind enough to put the guest room as far from the master bedroom as can be, thing that concerns us here is that guests will get too comfortable and be encouraged to over-stay their welcome. Downstairs, each of the four bedrooms has its own private pooper and one of the secondary bedrooms also opens to a small private patio where Your Mama and The Chicken would have sneaked cigarettes late at night during our rather rebellious teenage years. The oddly shaped master bedroom includes a fireplace for the romantic types, French doors that open to a private patio, a large walk in closet and a good-sized if oddly shaped bathroom that appears to have a party sized shower and a separate cubicle for the terlit and the bee-day. Interestingly, records show that in December of 1999, Ms. Davenport forked over $1,305,000 for a second house just spitting distance from the first one and also in the exclusive and expensive Emerald Bay community. Records indicate she continues to own the 3 bedroom and 3.5 bathroom house. DESCRIPTION: Beach front property located on a wide lot with 60ft of ocean frontage. 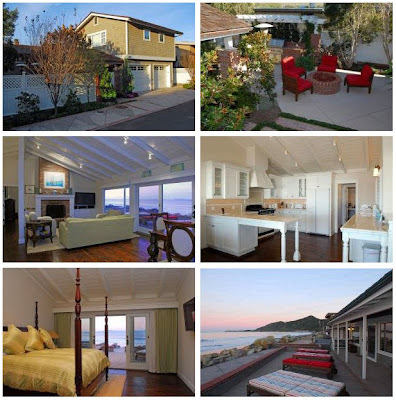 Extensively remodeled, this Cape Cod style property has sweeping ocean and coastline views. 4 surf spots and access to sandy beach, this is an exclusive surfer's paradise. Outdoor patio with BBQ area and gas fireplace. YOUR MAMAS NOTES: A few hours up the coast from Laguna Beach is the not exactly glittery or glitzy town of Ventura where Your Mama spent more weekends of our youth than we could ever count. See babies, our favorite, funny and foul mouthed Aunty Jennie used to live in Ventura. On our frequent visits she and our momma would often pile Your Mama, Sister Woman and cuzzins Lois and Toddaroohoo into a dearly loved automobile we called The Blue Vomit and dump us off at the low-brow Boo-ay-nuh Lanes where we were sternly told to spend wisely the five or six clams we were given while the two of them went for a few mid-day mai-tais at the Elephant Bar down the street. Those were some good times children, memories we will laugh about and treasure forever. Anyhoo, let's get back on track before we digress too deeply into the nostalgic recesses of our gin soaked mind. Just north of Ventura proper along one of the more dramatic sections of Highway 101, where the mountains meet the ocean, sits a line of ocean front homes set on a sliver of land between the highway and the crashing Pacific Ocean. One of those homes currently belongs to tennis titan Lindsay Davenport and her huzband Jon Leach who recently listed the property for sale with an asking price of $5,500,000. Property records show Ms. Davenport and Mister Leach picked up their ocean front getaway on Solimar Beach Drive in November of 2004 for $2,750,000. Records show the Cape-Cod-ish style house was built in 1970 and measures just 1,955 square feet. Listing information indicates the house contains three bedrooms and 3 bathrooms. It appears the street is gated and the small community has a couple of land side tennis courts where Lindsay and Jon probably humiliated neighbors during "friendly" games of mixed doubles. On the land side is a front facing two car garage that forms a small courtyard where a fire pit and built in bbq area have been installed. Having spent much of our life on the California coast, we know how the wind can whip off the water in a most unpleasant way sometimes, so this interior courtyard space was a smart idea for providing outdoor space out of the winds way. Although we don't care for Ms. Davenport's day-core and we would gone a different direction with the kitchen dee-zine, we still find this a very appealing, if somewhat unusually located beach house. The open plan living/dining/kitchen area has a wood burning fireplace for all those foggy mornings and chilly evenings, luscious looking wood floors, a high pitched ceiling and a wall of sliding doors that open up the the rear deck that is, thankfully, tucked up behind a revetment and stretches the width of the rear of the house. At least one of the bedrooms, presumably the master bedroom, opens to the rear ocean facing deck and also has lovely high ceilings, which were surely an important and welcomed feature for the six foot two (and a half) Ms. Davenport. Ms. Davenport was scheduled to play in the most recent Australian Open, but backed out after finding out she is preggers with her second child. Mavel-tov to the family. We suspect this might have something to do with the selling of these properties, but since we don't know nuthin' from nuthin' don't nobody quote us on that. Your Mama and the Dr. Cooter wish the couple the best of luck unloading their homes in a slumping economy and we hope to see Ms. Davenport working her stuff on the court soon. Wow. I like the Ventura property better than the Laguna one. "Investment banker". Does that, at the present moment, suggest perhaps a sudden drop in income or net worth, or somethin' like that? Depends. If the bank has money (some do - just not Joe's piggy bank), then now can be a pretty good time to be making long term investments. Way to go Mama.........now give us the lowdown on where the Williams sisters park their supremely talented booties. You can forget the childhood home. Laguna Beach is mostly casual laidback art types, hippie types and it's a very progressive gay town. Mama, about those trophies, the blonde wives, silicone etc., you might be confusing Laguna Beach with Laguna Niguel. There's also Laguna Hills and Laguna Woods. Four neighboring cities all with "Laguna" in the name, it's easy to get confused. Emerald Bay...as a kid I spent many happy hours boogie boarding (and occasionally wiping out) at the beach there. I like the old original houses which are fast disappearing. The newer architecture is hit and miss, this house isn't terrible but neither is it fantastic. I'd keep looking, especially at that price. Psychotic people in California and their over priced homes. You have to be retarded to buy these peoples homes that are trying to rip other people off. Do you get the Wimbledon trophy with this purchase? She really is sticking it to the buyer with that price. The house is one of the SMALLEST and is on the wrong side of PCH. No room at ALL between the houses on the over built lots. Check zillow.com out, you can get a bigger and better house below hers for millions less. Tons for sale in that area for WAY cheaper. I'll take the house across the street from hers which is on a double lot and three times larger for 1/3 less! I guess she thinks a fat ex-Wimbledon champ's house is worth a couple extra million? Or maybe her POS investment banker husband still wants to screw someone for one last time? Hope they get brunt on this over priced sale! Of all the names Mama has come up with, "Vlad the Revealer" is my all time fave. I hope it is not the case that she thinks the house is worth more because she owns it. 90% probably have no idea who she is. She may think herself and the investment banker are like Steffi Graf and Andre Agassi but surely they are not. the sale will show what it is actually worth. This is going to be a painful lesson for most California homeowners. The rest of the country has known for years that equivalent bricks and mortar are not worth that much more just because they are in California. For years, people who move there have been horrified by how little house you get for the money you paid. But most of them bought anyway. California is overpriced, overpopulated, overrated and now way overspent. Glad not to live there, sorry for those who do. I like the Ventura property better also. Of course this Your Mama's foul mouthed Aunt Jennie, mother of Lois & Todd-er-oo-hoo. As yes, I remember those days hanging out at the "Elepant Bar" drinking, lauging & smoking, while the youngens hung out at "Golf & Stuff" with all that money we gave you. Ahhhhhh, those were the days. Now this mega rich tennis player. I guess nobody works for a living anymore? Everyone just rips off everyone else and the country doing fast and shady money deals and packaged mortgages. Than they get a trophy wife. I would not brag about your husbands now ladies. They are about to be tarred and feathered and run out of the country on a rail. They will now have to wear their husbands titles like a scarlet letter. Something to be real proud of. I too prefer the Ventura property for it's views and proximity to them. Nothing about the Laguna house seems worth the $6+ million, so some of what is being asked must relate to it's exclusive enclave location. I find it's front stairway visually distracting, in that it's size and structure are prominent to a degree that graceful curves can't quite compensate for. Lindsay is not fat (to poster above), and you are never an ex-Wimbledon champ! No. You are always part of a special club at Wimbledon. Literally. That said...the decor of house number one is bad and boring. The beach house, though, has a great view. I'd prefer that place, but it is small. The asking prices may be high, I don't know. They will find out soon enough how attractive are these digs. I hope she has a girl and names her Bianca. Soledad, Trish and Maria are married to investment bankers? Should have gone to business school instead of law school. Could "investment banker" merely be a tarted up description of her money manager? If you're suprised Bartiromo and Regan are married to investment bankers, you're an idiot. They are both former financial industry types who are financial news anchors on CNBC in NYC. Sounds like one of the most logical things I've ever heard. As for them being "trophy wives", not only do they both know their stuff and do a nice job on that network, I am sure they both earn fat paychecks themselves. Also, I happen to think it's quite refreshing to see a professional athlete not married to another athlete or an actor. A little variety never hurt anyone. Hello, that’s a good post, I agree with most of what you are saying. Do you think that this will have a postive effect ??? The Laguna Beach house is nice. While Emerald Bay does have a number of silconed/salined/botoxed androids, the majority of the residents are just ordinary people who did well professionally and have decided to spend their dough in a way that allows them to take their golf cart down to a beautifull sandy beach whenever they get the urge. That being said, Emerald Bay has some incredible real estate. You can view all the homes for sale and for lease in Emerald Bay at http://www.EmeraldBay.com.